Rob Keogh and Graeme White shared all 20 wickets to spin Northamptonshire to victory against Glamorgan at Wantage Road, dismissing the Welsh side for 132 in the second innings as a second Championship win of the season was secured inside three days. After Keogh’s 9-52 on the second morning had given Northants the initiative in the game, claiming a first innings lead of 146, they never let up, Ben Duckett smashed 185 at better than a-run-a-ball in the second innings to set Glamorgan target of 451. It always looked beyond the visitors on a Wantage Road pitch that was in stark contrast to most of the flat and turgid Championship surfaces this summer, instead bringing back memories of 2005 when Monty Panesar and Jason Brown took ten wickets a-piece against Yorkshire. Whilst Keogh starred in the first innings, claiming Northants’ best figures in 58 years, it was White who took centre stage in the second. The 29 year old took a career best of 6-44, whilst Keogh added a further four wickets to finish with 13 in the match, the first Northants bowler to achieve that since Anil Kumble in 1995. Head coach David Ripley admitted they hadn’t expected the pitch to turn as much as it did, but praised Keogh, White and Duckett for producing the individual match winning displays. “There were lots of good individual performances but as a team and a collective I felt we were up for it and we do want to finish the season strongly,” he said. “I think yesterday’s cricket particularly was sensational, someone picking up nine wickets and someone going out and smashing a brilliant hundred. 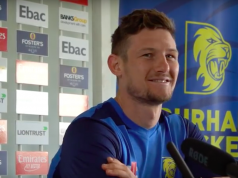 “The quality of Ben’s innings, particularly when we’d just bowled Glamorgan out, it looked pretty tough, to come out and take the game away from them was pretty special. A key part of Northants’ white ball success this season, White has struggled to make an impact in the longer format, with the county often opting to go with Rob Keogh as the spin option alongside a seam heavy attack. But on the perfect wicket for spin, White spearheaded the victory charge taking six of the first eight wickets to fall, recording his maiden first-class five wicket haul, whilst Keogh removed the last two to wrap up victory and finish with a remarkable haul of 13 which Ripley said shows his development into a genuine all-rounder. “Really pleased for Graeme, I think he’s an improving cricketer,” Ripley said. “His white ball consistency has been really good this year, he’s been upbeat, a competitive part of our side and his red ball statistics are not as strong as they could be. 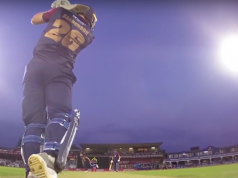 The victory was Northants second of the Championship season, having also beaten Glamorgan at Swansea last month, before which they were in danger of finishing bottom of the Division Two table having failed to win any of their first ten games. However two wins have lifted them clear of Derbyshire, and following the conclusion of their white ball cricket for the summer, Ripley is pleased with the form they are showing as they aim to finish the season on a high. “I think we sowed some good seeds at Worcester [last week], and before that we won at Swansea so we’ve just found some form at the wrong end of the season, would perhaps have been nice to be out of the blocks at the start of the year but it’s nice to be playing well.